I parked my X-trail at the Puketi Recreation Centre in Waiare Road, hoping that it would still be there in two day’s time. I had emptied everything out of it, and left the glovebox open to show there were no hidden valuables, but I was a bit nervous even though there was a campsite there with quite a crowd of people. A sign near the information board claims the area is under video surveillance, but I couldn’t spot any cameras. Felicity and I piled in to Mike and Tannis’ Subaru and we continued driving west, almost to Mangamuka Bridge at the top if the Hokianga. Just before the township we turned into Omahuta Road and began climbing into the hills. As we turned into Omahuta Forest Road, heading towards the Kauri Sanctury, we had to stop while the farmer removed an electric fence he had strung across the road so he could move his cows. This intersection is the start of Jacksons Road on my topo map, but is incorrectly labeled as a continuation of Omahuta on the Te Araroa map (just before KM 170) which is potentially confusing for walkers looking for the wet weather alternative route. When we reached the end of the road where the tracks through the sanctuary start, we realised we had missed the Apple Dam campsite where we intended to spend the night. As we drove back down the road, we stopped to pick up a young Canadian woman called Annie walking the trail who had also passed the camp turnoff. We found a green pole (no gold as mentioned in the track notes), with a few holes marking where the sign has been torn off, and waved goodby to Tannis and the vehicle. 100 metres down a grassy track is a pretty campsite beside a pond, decorated with water lilies. After pitching our tents and cooking dinner the four of us walked back up the road and explored the loop track through the kauris. The sun was low in the sky by now, so the tops of the trees had a golden glow that contrasted nicely with the deep greens beside the trail. There were dozens of rosellas screeching in the treetops, so I kept seeing flashes of red as they flew about. There are several large, named trees beside the trail, and one which has fallen in the last year or so lying right across the path. We walked along the trunk to the broken stump, and could see that the centre of the tree had rotted out leaving just an outer ring of wood that eventually couldn’t stand up to the wind. Further up the track we found another fallen kauri that was so big people have built a rough wall on either side to make a hut underneath. It was rather rotten and damp though; not as inviting as our tent. We had just drifted off to sleep when I heard our aluminium pots clattering outside as some animal investigated them. A little while later I heard a Kiwi calling a few hundred metres away, and woke Felicity so she could listen too. I considered going out to look, but decided it was a bit far off to make it worth the effort. After breakfast we packed up our gear and walked back down the road to the Kauri Pa Road turnoff where the Te Araroa route leads into the forest. 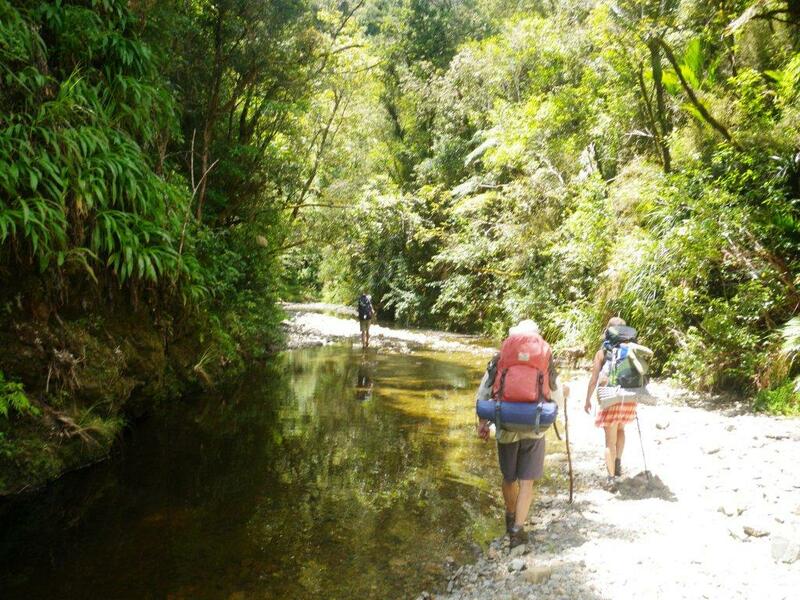 At first we were mostly passing pines and a few eucalyptus, with lots of gorse and pampas (cutty) grass, but finally we reached the Mangapukahukahu Stream where the exotic trees end and the native forest begins. We were hot and sweaty by this time, so when we came to a pretty pool on a bend in the creek we stripped off our clothes and dived into the clear water. Sadly, it didn’t stay clear for long because didimo (AKA rock snot) has infested this creek and as soon as our feet touched the bottom the water became murky, although still very refreshing. The valley sides narrowed, and the next few kilometers we were splashing through the water at the bottom of a gorge. 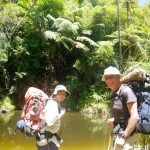 The scenery exceeded our expectations, and we took our time to look around and enjoy the beautiful bush. There were lots of huge kauri snail shells on the gravel banks, and berries from karaka, pururi, taraire and nikaus. At lunchtime we had another swim in much cleaner water, although there was still a bit of didimo. The creek zig-zags back and forwards between gravel banks, so we were walking in the water a lot of the time. Even the deepest crossings were below our knees, but it is a route that could quickly become dangerous if it was raining upstream because there is no alternative way out of the gorge. 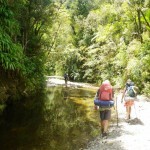 When the creek reached the Waipapa river we followed the track markers to the crossing and headed upstream. The track through the bush didn’t have the same beautiful views as out in the open, so we soon decided to head back into the water and continue with wet feet. This section of the river seems to be free of didimo which makes the bottom much less slippery and the water clearer. Felicity spotted watercress at one point so we stopped to harvest a bag to supplement our dinner and the next day’s lunch. After a couple of kilometers we started looking for the beginning of the Puketea Ridge track, which is not marked on the river. Murray had warned us that it was difficult to spot, and told us to watch for the first creek on the true left. We arrived at a very small tributary that was almost dried up, so I got out my topo map and turned on the GPS to check exactly where we were. It showed the track leading from the fourth creek (as marked on the map), a little over a hundred metres further on. 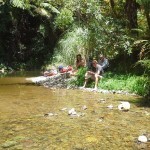 The Pukatea stream is quite obvious when you see it, certainly the first branch of any significance. When you walk up just a little way you see the orange track markers showing the crossing, with a DOC track sign on the true left bank nearby. Realising that this was likely to be our last chance for a wash, we spent some time swimming in a large pool in the river. 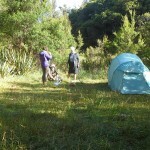 The four of us were wandering about naked while we dried in the afternoon sun when we discovered we were not alone and that about half a dozen people were already occupying our intended campsite at the bottom of Pukatea Ridge. There was no space left so we briefly considered continuing on, but eventually found three small flat spots in the bush to pitch the tents. This turned out to be fortunate because the next possible campsite would have been hours away, and the lack of space near our tents meant that we set up our kitchen on the banks of the stream nearby. Because we were out in the open on a gravel bank we decided it would be safe to have a campfire, so Mike successfully demonstrated the upside-down technique of fire starting, with big logs undernieth and increasingly small pieces on top. After dinner we watched the sunlight retreating up the side of the valley to our east, and sat beside the fire sipping whisky, eating chocolate and listening to the river burbling by. It was an idyllic end to one of the most enjoyable day’s tramping I can remember. Next morning we weren’t in a hurry to leave, partly because we mistakenly thought we only had 8KM to walk (actually it was 14), but also because it was such a pleasant spot. Mike even started a couple of Pooh-stick races in the river for our amusement after breakfast. It was after 10 AM by the time we were ready to set off up the ridge, which was an unrelenting 3.5KM climb out of the valley to the Takapau Track. 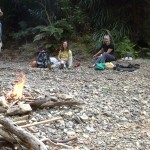 Fortunately we were in kauri forest the entire way so the surroundings were very pleasant. 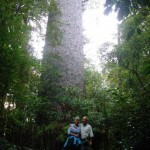 At the top we hid our packs in the bush and walked 500M south to visit the huge the Takapau No.2 kauri. It isn’t as big as the ones in the Waipoa Forest, but impressive nonetheless. Not long after putting our packs back on we reached the Pirau Ridge 4WD road, and started the final 9KM walk to the car. We were all hoping to find another river to cool off, but unfortunately we were too high up by this time. We did find a pleasant grassy spot in the shade to eat lunch and enjoy the last of the watercress in our sandwiches. We reached the Recreation Centre late afternoon and I was relieved to see the car was waiting for us. Annie decided to continue on towards Kerikeri so we waved goodbye and set off back to Taupiri Bay.